Forty in Counts and Measures. In the Bible, next to the number seven, the number forty occurs most frequently. In Talmudical literature it is often met with, in many instances having been apparently used as a round number or as a concrete and definite expression in place of the abstract and indefinite "many" or "some," and hence becoming a symbolical number. As regards the period of forty years, the Jews seem to have shared with other peoples, especially the Greeks, the notion that the fortieth year was the height or acme of man's life; and from this fact forty years came to represent a generation (compare Nöldeke, "Untersuchungen zur Kritik des Alten Testaments," p. 188). The rain which brought about the Deluge lasted forty days (Gen. vii. 4, 12, 17); the same period passed between the appearance of the mountain-tops and the opening of the windows in the ark (Gen. viii. 6). For the embalming of Jacob forty days were required (Gen. 1. 3). Moses was without food on Mount Horeb for forty days (Ex. xxiv. 18). Elijah wandered without food for the same period (I Kings xix. 8; compare also the fasting of Jesus previous to his temptation, Matt. iv. 2). Ezekiel was ordered to lie on his right side forty days, to represent the forty years of the sin of Judah (Ezek. iv. 6). Forty days were spent by the spies in Canaan (Num. xiii. 25); Goliath challenged the army of Israel for forty days (I Sam. xvii. 16; compare Soṭah 41b). The same number of days was granted Nineveh for repentance (Jonah iii. 4). They also form the period required for purification after thebirth of a male (Lev. xii. 2, 4), while after that of a female it is twice that number of days (ib. 5). Isaac married when forty years old (Gen. xxv. 20); so also Esau (Gen. xxvi. 34). Caleb was of the same age when sent as a spy (Josh. xiv. 7); and so was Ish-bosheth when commencing his short reign (II Sam. ii. 10; compare Acts vii. 23, where the age of Moses, when he was called to become the deliverer of his people, is given at forty years). Israel sojourned forty years in the desert (Ex. xvi. 35, and frequently elsewhere). The same period is given for the rule of each of several of the judges (Judges iii. 11), and for that of Deborah (v. 31, viii. 28; I Sam. iv. 18), as also for the reigns of David, Solomon, and Joash (II Sam. v. 4; I Kings ii. 11, xi. 42; I Chron. xxvi. 31, xxix. 27; II Chron. ix. 30, xxiv. 1). So also Israel was oppressed by the Philistines forty years (Judges xiii. 1). In Ezek. xxix. 11-13 a desolation of forty years is predicted for Egypt. A multiplication of 40 by 3, or three generations, is seen in the 120 years of the life of Moses (Deut. xxxiv. 7; compare Gen. vi. 6). 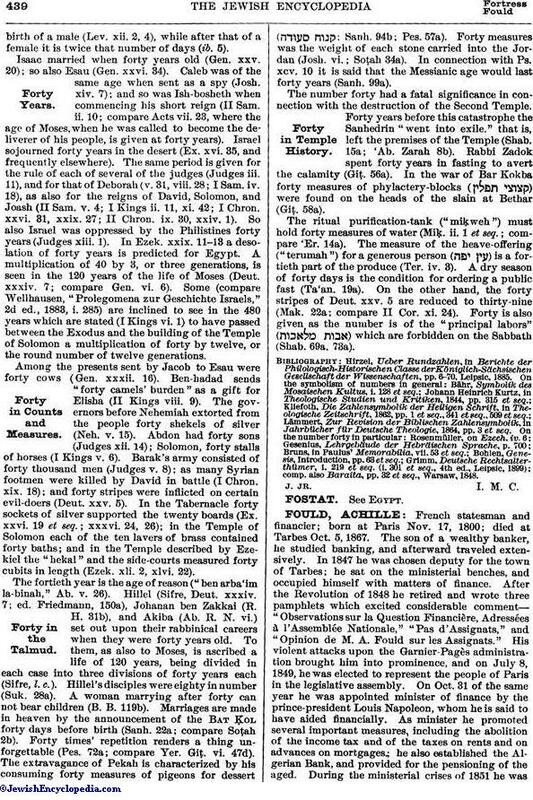 Some (compare Wellhausen, "Prolegomena zur Geschichte Israels", 2d ed., 1883, i. 285) are inclined to see in the 480 years which are stated (I Kings vi. 1) to have passed between the Exodus and the building of the Temple of Solomon a multiplication of forty by twelve, or the round number of twelve generations. Among the presents sent by Jacob to Esau were forty cows (Gen. xxxii. 16). Ben-hadad sends "forty camels' burden" as a gift for Elisha (II Kings viii. 9). The governors before Nehemiah extorted from the people forty shekels of silver (Neh. v. 15). Abdon had forty sons (Judges xii. 14); Solomon, forty stalls of horses (I Kings v. 6). Barak's army consisted of forty thousand men (Judges v. 8); as many Syrian footmen were killed by David in battle (I Chron. xix. 18); and forty stripes were inflicted on certain evil-doers (Deut. xxv. 5). In the Tabernacle forty sockets of silver supported the twenty boards (Ex. xxvi. 19 et seq. ; xxxvi. 24, 26); in the Temple of Solomon each of the ten lavers of brass contained forty baths; and in the Temple described by Ezekiel the "hekal" and the side-courts measured forty cubits in length (Ezek. xli. 2, xlvi. 22). The fortieth year is the age of reason ("ben arba'im la-binah," Ab. v. 26). Hillel (Sifre, Deut. xxxiv. 7; ed. Friedmann, 150a), Johanan ben Zakkai (R. H. 31b), and Akiba (Ab. R. N. vi.) set out upon their rabbinical careers when they were forty years old. To them, as also to Moses, is ascribed a life of 120 years, being divided in each case into three divisions of forty years each (Sifre, l.c.). Hillel's disciples were eighty in number (Suk. 28a). A woman marrying after forty can not bear children (B. B. 119b). Marriages are made in heaven by the announcement of the Bat ḳol forty days before birth (Sanh. 22a; compare Soṭah 2b). Forty times' repetition renders a thing unforgettable (Pes. 72a; compare Yer. Giṭ. vi. 47d). The extravagance of Pekah is characterized by his consuming forty measures of pigeons for dessert ( ; Sanh. 94b; Pes. 57a). Forty measures was the weight of each stone carried into the Jordan (Josh. vi. ; Soṭah 34a). In connection with Ps. xcv. 10 it is said that the Messianic age would last forty years (Sanh. 99a). 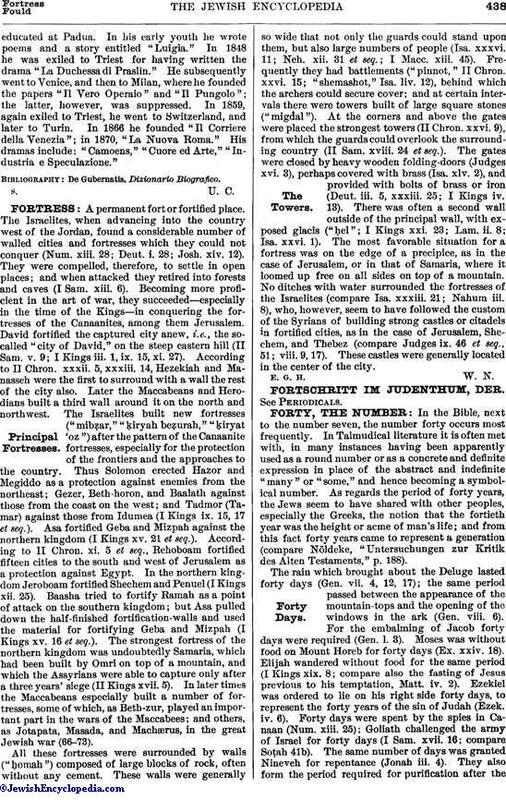 The number forty had a fatal significance in connection with the destruction of the Second Temple. Forty years before this catastrophe the Sanhedrin "went into exile," that is, left the premises of the Temple (Shab. 15a; 'Ab. Zarah 8b). Rabbi Zadok spent forty years in fasting to avert the calamity (Giṭ. 56a). In the war of Bar Kokba forty measures of phylactery-blocks ( ) were found on the heads of the slain at Bethar (Giṭ. 58a). The ritual purification-tank ("miḳweh") must hold forty measures of water (Miḳ. ii. 1 et seq. ; compare 'Er. 14a). The measure of the heave-offering ("terumah") for a generous person ( ) is a fortieth part of the produce (Ter. iv. 3). A dry season of forty days is the condition for ordering a public fast (Ta'an. 19a). On the other hand, the forty stripes of Deut. xxv. 5 are reduced to thirty-nine (Mak. 22a; compare II Cor. xi. 24). Forty is also given as the number is of the "principal labors" ( ) which are forbidden on the Sabbath (Shab. 69a, 73a). comp. also Baraita, pp. 32 et seq., Warsaw, 1848. J. Jr. I. M. C.